Approximately 110 miles south of Anchorage, Alaska is a little river known as the Russian river. The Russian river is only 12 miles in length and originates in the upper Russian lake then flows through to the lower Russian lake and lastly drains out into the Kenai River. This river may be small but the Russian river is a big attraction for local salmon anglers looking to get in on the Sockeye action. The Russian river gets two healthy runs of Sockeye twice a year, one is the summer and another in the early fall. Once the sockeye runs die off, the fall Coho start to show up in nice numbers as well. Generally there is not as much competition for these fish because the Sockeye season has come to end. Every other year the Pink salmon enter the Russian river and as well, but the Pink salmon is not considered as desirable due to the Pink salmons rapid deterioration rate during spawning. Unfortunately by the time the Pinks enter the Russian river they are to far gone for the dinner table. Another less known treasure is the Rainbow / Steelhead season on the Russian river. Rainbow season generally picks up in the fall and best of all there really isn’t much competition for them. Note: Chinook do run this river as well but retention is generally closed when they spawn the Russian river. Be sure to read the ADFG Regs before retaining any Chinook from this body of water. This russian river is pretty much catch and release year round, but from mid July to October retention of certain species of salmon and trout are allowed. 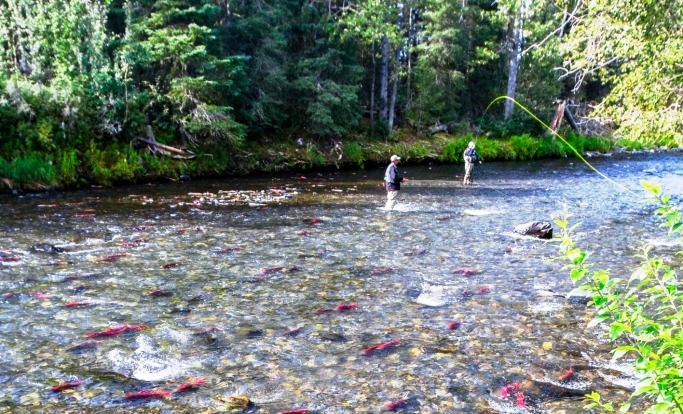 This fishery generally allows 3-6 Sockeye per day, depending on the season. or 1-2 per day of other species. **See Alaska Department of Fish and Game REGS for details. Bait scent for trout of salmon. Top Recommendation for this location is plunking or drifting eggs. next possibly a stealhead jig, or corky and yarn and lastly spinners.